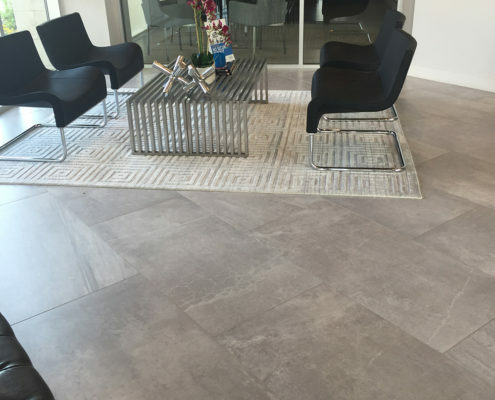 Phoenix tile from Villagio Tile & Stone is the durable, versatile, and affordable option in home flooring. Villagio Tile and Stone is a leading provider of ceramic tile and stone in the greater Phoenix major metropolitan area. Our design store and outlet in Phoenix stocks the finest quality stone, ceramic, glass, and metal floor tiles sourced internationally. In a spacious showroom, customers will find a wealth of industry-leading products for the creation of unique, tiled designs, as well as expert advice from in-house design specialists. Installing tile is a surefire way to add beauty and value to your home. Using an interactive showroom, the Villagio design team employs samples and digital wizardry to help you visualize how different types and styles of tile can affect the ambiance and look of a room. Ceramic or marble tiles can be used in a bathroom as a patterned floor treatment, or in a spa-style shower enclosure. The bathroom is ground zero for intricate tile design and it is possible to tile literally every surface. Installed correctly, tiling is a water-tight surface material and easy to keep clean. Decorative tiles make a distinctive and practical sink backsplash or stovetop surround in the kitchen. Materials can be as simple as an all-white porcelain subway tile or as intricate as a custom pattern using colorful hand-fired and painted ceramic tiles from the Mediterranean region. Mosaic tile, used as a floor design in a foyer or entrance hall, makes for a spectacular welcome home. Mosaic tile has been used for millennia as a hard wearing, visually stunning floor or wall treatment. Ceramic planks may resemble wood but make a much sturdier flooring material in kitchens and living rooms. They are available in a large range of muted or glossy finishes. In regions with a year round warm climate, ceramic planks have the added advantage of remaining cool to the touch. A restrained hint of bronze, aluminum or pewter metal accent tile adds luxury and a bit of bling to the kitchen or bathroom. In similar fashion, rare stones can be incorporated in a tile design for an understated touch of glamor. Whether you’re thinking about a striking decorative feature or a full room flooring treatment, chances are Villagio Tile and Stone in Phoenix has a solution for your project, no matter how challenging or complex. Travertine, ceramic planks, hand-crafted artisanal accent tiles, glass and metal, marble, porcelain tiles – every color, texture, size and configuration you can imagine is on hand. If you’ve got a tile project in mind for your home or office, Villagio Tile and Stone in Phoenix would love to help. To learn more about products and services, call (480) 422-6700 or contact us online today!